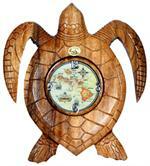 Sea turtles symbolically represent the various powers of sea life in the ocean for the Hawaiian people. We offer turtle jewelry and turtle gifts that make for great treasures. From turtle necklaces carved from wood, turtle earrings, and other Hawaiian turtle jewelry, these are great for any turtle lover! We have key chains, clocks, and coasters too, so you can decorate your surroundings accordingly. These are a quick sample of turtle items we have. For a more complete set, type what you are looking for into the search box at the upper left or just click on this link for all Sea Turtle Jewelry and Turtle Gifts.